Writing about managing, mentoring and making design with team's remotely. Views are my own. To drive marketing growth I recommend what is now a classic Inbound marketing technique; Drive leads through identified “awareness” keywords and content matching, hosted on a variety of landing pages coupled with thank you pages which host links to gated content. Therefore today I’ll be walking you through a step-by-step process of building landing pages and performing SEO and CRO (conversion rate optimization) on those landing pages using multivariate testing tools and techniques. Now don’t let the buzzwords and acronyms scare you, I promise this will all become clear after your done reading this how-to article. First thing’s first, why Inbound? More and more Inbound marketing methods are becoming the go to approach for driving leads. Not just for small businesses with small marketing and ad budgets but larger advertising and marketing agencies. Full disclosure. I’m a fervent believer in the combination of Inbound and Outbound techniques. It should never be a binary decision. Inbound is good for transactional marketing. Outbound advertising and marketing are great for relationship marketing. The kind of marketing where your building brand narratives and fostering emotionally driven relationships with your audience. But no matter how you slice it, each method requires three fundamental things, knowing your audience, writing a good brief and great creative. Now if you’re already an Inbound marketing “whiz” (please don’t ever say that at loud or admit to someone that’s what you call yourself because it sounds, well you know) this article is probably not for you. If your just getting started with marketing automation and are using a marketing automation tool(s) like HubSpot and or Marketo you’ve come to the right place. *This article presumes you have a working knowledge of the Inbound methodology and practices. That said if you don’t I’d highly recommend starting with HubSpot’s free Inbound certification course. Before we start let me be really clear. These Proto-Personas are your best GUESS at who you think your buyer is. 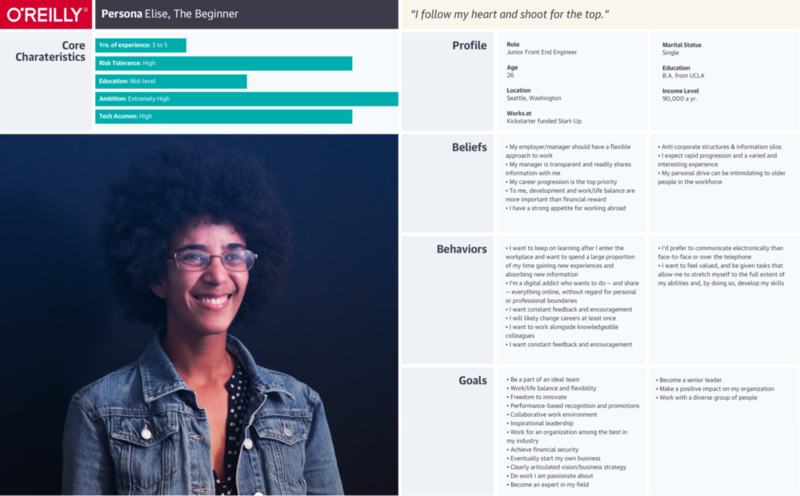 Proto-personas are informed by market research and stakeholders within your company and or your client’s company. That means your going to hear a lot of assumptions. Assumptions are just that, they’re a collection of biases informed by subjective observations from people other than your customers. So unless you’re a soothsayer you’ll want to launch, test, learn and iterate these personas over time. Thankfully landing pages are a good first start in this pursuit. What is a Buyer Proto-Persona? In your surveys, you’ll want to understand what drives your potential prospects through the Inbound funnel to make a purchase decision. From awareness, consideration, intention, to decision to buy. Here’s the thing, surveys by no means are a one size fits all and therefore I have no prescriptive methods. Look for a forthcoming article from me on customer research and how to drive an organization's mindset in creating customer-centric solutions. I’d recommend using the following services for recruitment. Make sure that you include incentives for respondents. For ex. A 25.00 USD Amazon gift card for each successful survey completed. Once you’ve conducted your interviews look for common themes amongst them, and through this begin sorting out the prevalent ones. This sorting on its’ own typically produces particular Persona categories, giving you, on average, a range of 3 persona types with some potential outliers. When done you should narrow your personas down to a minimum of three. Your Persona should look something like this. With Personas in hand, you’ll want to analyze the keywords of your personas in three key areas. Using these tools below, you’ll use your personas to help you determine what kind of keywords your buyers are using. Best Practices for Keyword Matching: This is easy to do but hard to perfect. Here are a couple methods to easily get you started. Use a customer mindset, what would they search on? Landing pages work best when you have gated content that is applicable to the primary keywords you’ve identified. Allow me to demonstrate, for instructive purposes, using the following hypothetical scenario. Call to Action; The Call to Action on your page might seem like a benign item when it comes to driving conversions but you’d be mistaken. It’s size, location and, nomenclature all matter. Here are a few good rules to start from when creating your CTA. Use active verbiage; get, request, download, etc. Creating as many variations to test as possible; Companies with 30+ landing pages convert 7% more visitors than companies with 10 or fewer landing pages. For your purposes start off with 15 landing pages. And on these landing pages I’d recommend trying many different variations of keywords and content matches, forms, CTAs, and imagery to determine, through sign-ups and viewing and or download of content offers, which landing performed the best using quantitative (What happened) and qualitative (Why did it happen) methods. And if your thinking A/B testing, don’t, this creates a “garbage in and garbage out” data set. Why? It presumes that one of the two solutions you have is THE solution. Combining the elements derived from Steps 1 and 2, it’s time to lay them out into a simple two click-thru scenario. Download and or view the gated content. 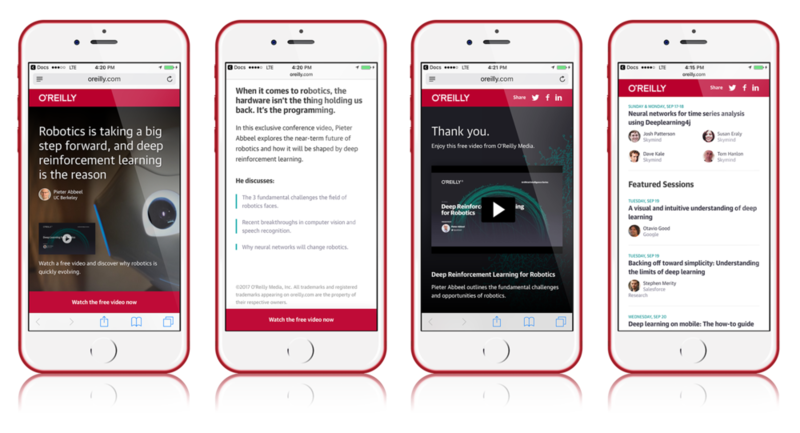 Here you can see a mobile example we created for driving conversions to O’Reilly’s Artificial Intelligence conference. How to conduct a multivariate test; It’s time to conduct tests against the variations present on your 15 different landing pages. Depending on the nomenclature used, placement of content, offer type, keywords used and or from submission required the success of your conversions can vary greatly. You want to find that sweet spot. You want a large enough data set to make determinations about what’s working and what isn’t. I recommend for your first test no less than 14 business days. Review your benchmarks, hit or missed, and make refinements to the pages and elements showing more promise. Multivariate Testing in Action; Five Simple Steps to Increase Conversion Rates. Paras Chopra. Multivariate Testing 101: A Scientific Method of Optimizing Design. Paras Chopra.